Ninety years ago this month the first live sports commentary was broadcast by the BBC. That "first broadcast description", as the BBC Hand Book described it, was on the rugby match between England and Wales at Twickenham. The commentator was Captain H.B.T. Wakelam. But who was Captain Wakelam and how come he was given that task of covering that match. And, as it was the first ever such broadcast (at least on this side of the Atlantic) how did he know what to do? The answers can be found in Wakelam's 1938 autobiography Half-Time "The Mike and Me". Firstly a brief biographical portrait. Henry Blythe Thornhill Wakelam, known as Teddy, was born in 1893 in Herefordshire were his father was the County Engineer, a very keen all-round sportsman and "an extremely good shot". The family moved to London when his father was appointed to a job in Middlesex. Young Teddy was educated at the Middleton School in Bognor where he was sent as a boarder. Here he developed his love for playing sport; he'd go on to play rugby, cricket, football, hockey and tennis which stood him in good stead years later when he was asked to commentate on a range of sports for the BBC. He continued his education firstly at Marlborough College, Wiltshire and then Pembroke College, Cambridge where he initially studied medicine but due to "a very distinct aversion from corpse dissecting" switched to history. 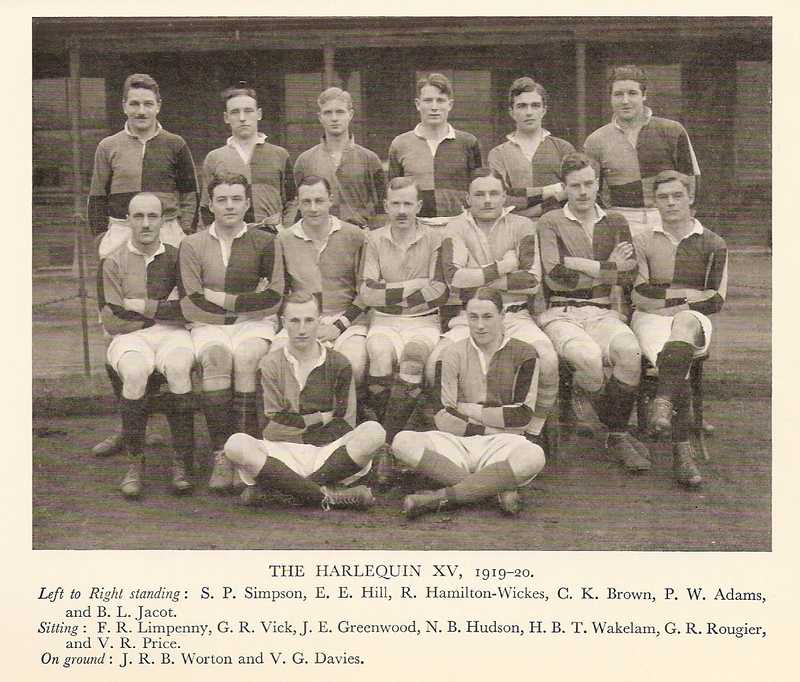 While at Pembroke he played rugby for a number of clubs before joining Harlequins for whom he turned out on many occasions over three years up until the war. Indeed he was so busy on the sporting field that he feared he was spreading himself too thinly: "I think ... that I attempted too much in those days. Four days a week I was playing either rugger or hockey for Pembroke, and my Saturdays were also fully taken up playing either for the Varsity at one of other game, or for the Quins. Perhaps had I concentrated more I might have been successful." On the outbreak of World War One, Teddy was accepted as a 2nd Lieutenant in the Royal Fusiliers; by 1917 he'd been promoted to Captain of the 96th A.A. Section. He saw service in France, Gallipoli, Egypt and Palestine. 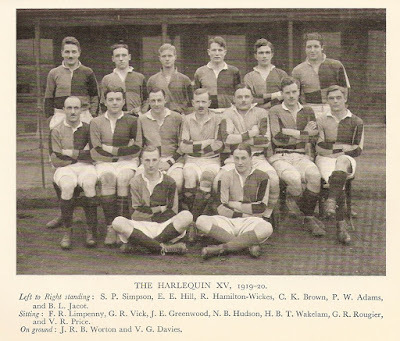 After the war there was a period of post-war liaison work for the Army in Poland and Germany and he started to play rugby again, initially for the Public Schools Services and then for a reformed Harlequins where he'd eventually captain the team. He gained employment with the contractors and building firm John Mowlem & Co, mainly working on contracts for the London County Council. In 1922 he married Vera Greenhill, the following year they had their only child Elizabeth. 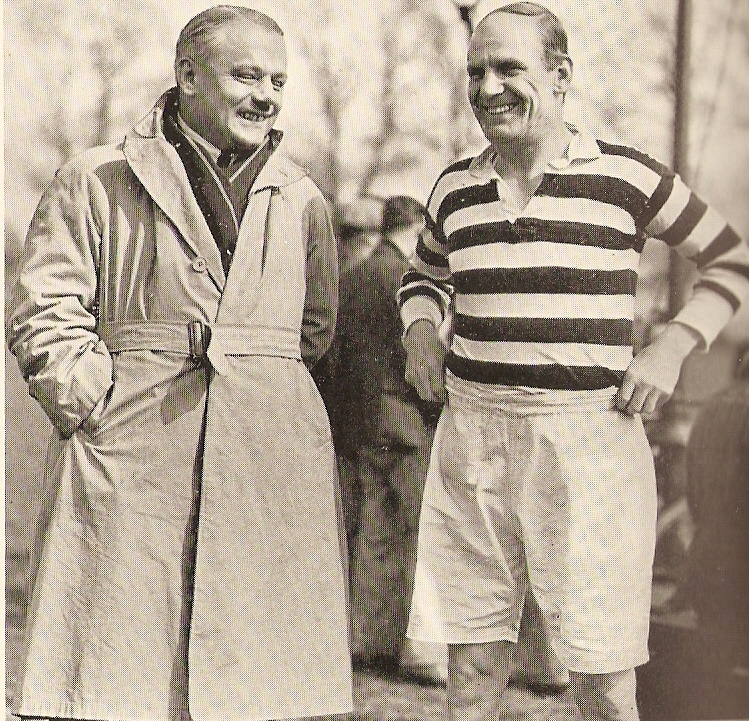 By 1924 Wakelam was forced to retire playing rugby due to a knee injury but he very much remained part of the sport as well as taking on duties as a Wimbledon umpire. Meanwhile over at Savoy Hill the British Broadcasting Company had become a Corporation on 1 January 1927 and gained some additional rights to broadcast reports of sporting events, rights that the press had previously jealously guarded. 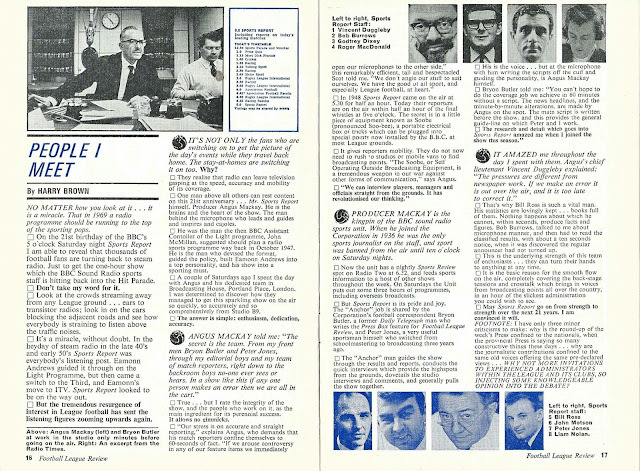 The BBC had already decided to introduce the type of live commentary that American radio was doing and it was on the lookout for possible commentators, broadcasters who would be pioneers in the field. 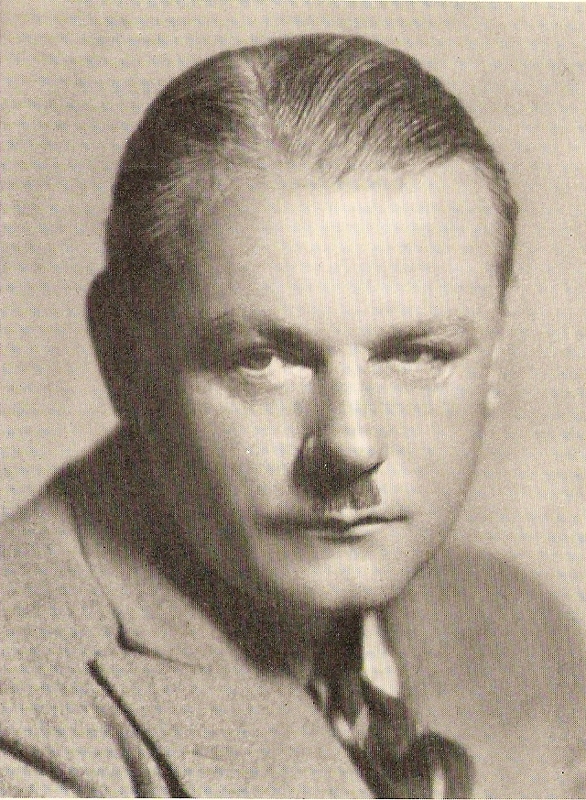 On 7 January the Director of Entertainment, Roger Eckersley, issued a memo to Station Directors expounded on the subject, suggesting that the person giving the running commentaries "probably will be difficult to find, as he should have the journalistic instinct, a decent voice, a sound communicable knowledge of the subject, and the power to make listeners feel as though they were present at the event". Asking around the name of Teddy Wakelam came to the BBC's attention, especially useful as the first commentary game was to be a rugby match. Such were the hurried and last minute arrangements that the commentary, on 15 January 1927, was not billed in the Radio Times. Wakelam's autobiography takes up the story at this point in some detail and I've reproduced a few paragraphs of it below. The other players in this story are Lance Sieveking who joined the BBC in April 1926 with special responsibilities for topical talks and news. He'd recently returned from a trip to the States to witness how US radio covered baseball matches. 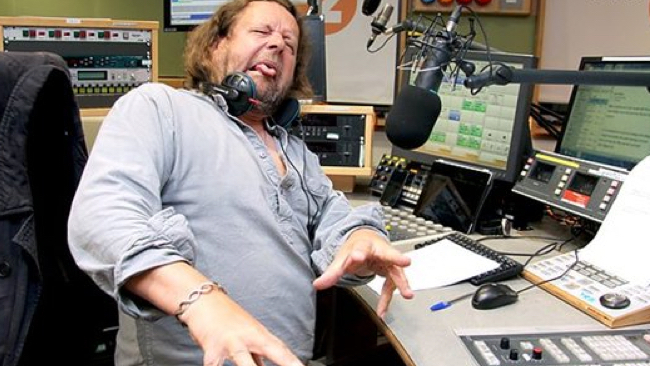 He later work mainly in drama, producing and script editing for both BBC radio and TV. Wakelam's number two was a chap called Charles Lapworth who seemed to have no obvious connection to rugby. He was a former editor of the Daily Herald and had worked at other newspapers both in the UK and the USA. This was his one and only appearance as Wakelam's sidekick. The reference to "a St Dunstan's man" is the home for the blind for ex-servicemen and women, now known as Blind Veterans UK. "One afternoon I was sitting at my table working out some details of a tender, when my telephone rang. An unknown voice at the other end then asked me if I was the same Wakelam who had played Rugger for the Harlequins, and upon my saying 'Yes' went on to inform me that the owner of it was an official of the British Broadcasting Corporation, who would much like to see me at once on an urgent matter. Turning up at the arranged meeting-place, I was welcomed by Lance Sieveking, the gentleman in question, who thereupon explained to me the reason for his call. Briefly it was this. Since the BBC in January 1927 had become a national institution, its scope had become considerably wider, and it had been decided to follow a recent American innovation, and to put out running commentaries on important sporting events. It was proposed a start should be made with the Rugby International at Twickenham, between England and Wales, on January 15, and would I be prepared to undergo there and then a studio microphone test in order to see if my voice was suitable, and then, should such prove to be the case, to take part in an actual field trial to be held the next day on the Guy's Hospital Ground at Honor Oak Park? On the principle of 'try anything once,' and also with the confined conviction that if an American could do it I could, I agreed, and duly passed the 'Mike' test. The next day, three days before the actual match, together with Sieveking, a man called Lapworth, who had the vast knowledge of the American film world. and two other competitors, I went down to the Guy's ground as arranged, but alas, something had gone wrong, and no engineers or microphones turned up! This was a bad start; but things grew even worse when eventually we did find them, in Greenwich Park, watching a game between Blackheath Wednesday and the Royal Naval College, Greenwich, for no sooner had they started to get their elaborate and fearsome-looking gear when up came a large and very important park-keeper, full of righteous indignation, and we departed sadder but considerably wiser men. By this time it was too late to seek other fields, so we were asked by a most apologetic Sieveking to parade again the next day, if a match could be found upon which we could give a try-out. There proved to be one at the Old Deer Park, Richmond, an inter-schoolboy affair, where the same party again assembled, and after the lines and so on had been run out and fixed up, we started on our 'dummy run.' After it was over, Sieveking came up to me, and asked me if I would have shot at doing the match as proposed. I agreed, subject, of course, to suitable financial remuneration, a point upon which both of us very naturally were quite at sea. That, however, was put aside for the moment, and we set out straightaway for Twickenham to examine the selected position and to study the arrangements. Arriving at Twickenham, Sieveking and I were met by Commander Cooper, an old and valued friend of mine, and together we examined our perch, which was a somewhat rickety-looking hut mounted on a scaffold platform at the end of the then single-decker West Stand, in the south-west corner. Here the engineers were hard at work wiring up and installing the microphones, and we for our own part worked out in detail our proposed plan of campaign. here the first squared plan of the field came into being, the facsimile of which so often nowadays is printed for the benefit of listeners in the Radio Times, and here was put up a notice for our own particular benefit, a notice which, printed in large red letters, was 'DON'T SWEAR' (not that I any more than the rest of my fellow-men am addicted to the use of strong language, but sometime, watching Rugger, one is apt to get carried away!). The order of the seating was also decided upon, and Sieveking finally was struck with a most brilliant idea, which was to prove of the utmost worth to me on the day. He decided to get hold of a St Dunstan's man who, before his terrible misfortune, had been a keen Rugger follower, and to invite him to sit just in front of the open window of the box so that I could talk as if explaining the game directly to him, and so perhaps lose some of my very natural stage-fright. Having fixed these and other small details, we returned to town, and duly reassembled n the site an hour or so before the game on the fateful day. Then I learnt that Charles Lapworth should be my 'No. 2,' or, as someone immediately and appropriately remarked my 'Dr Watson.' In many ways he was very well suited to his job, for he was the personification of cool and calm collectedness, though his knowledge of the actual game itself was rather limited. In fact, the only football he really knew at all was the American game, as one of his remarks was to prove. Ten minutes before the kick-off, we came on the air, Sieveking first to give the atmosphere, reading out the now familiar copyright notice and doing the introductions, and then a somewhat shy and diffident me, to give out the details of the game and the names of those taking part in it. On the stroke of the appointed time, the match was started, and we were off. Straightway I forgot all my nervousness and stage-fright, all my previously and arduously collected phrases, and all the, as I thought, snappy and pithy expressions which I had anxiously culled from the leading sporting writers of the day. I was so wrapped up in following the flight and fortunes of that ball, and so desperately keen to keep my St Dunstan's man fully informed, that I raced away like a maniac and then and there, I think, got into the habit which I still maintain is essential) of being just a fraction ahead of the actual game. By that I mean the necessity of starting to speak of a man as passing just as he is shaping to pass, a poor description and example to illustrate my point, but nevertheless a correct one, for it is actually the truth. My memories of the actual game itself that day are, I am afraid, very vague indeed, in fact I do believe when it was over that I could recall one single football incident, though I do remember some of the gap-filling remarks which are, of course, essential when play is temporarily held up for this or that reason. Once Lapworth, doing a hero's work in all conscience, said to me in one of these pauses, 'Do they always play with an oval ball?' a remark which may to any Rugger player appear ludicrous, but it reminded me that many of my audience were not familiar with the game, and so helped me to keep away from being too technical (a most serious fault). Again, he said, after one of the Englishmen had been hurt, and had to leave the field, 'Who will they send on instead?' another apparent bloomer, but a chance for me to fill in b y saying that the practice of replacements had not so far (and I sincerely hope never will) become part of the Rugby football creed. And so, back to earth, and tempting my Celtic fervour, with Sieveking's commanding hand sometimes waving me back when I crowded on to the mike and so was in danger of blasting, and with the 'Don't swear' notice ever before my eyes, I got somehow to half-time. and a welcome breathing-space, filled in by atmosphere from the outside mike, and a few more remarks from Sieveking. Hereabouts I am popularly supposed to have remarked, sotto voce (which of course makes no difference), 'What about having a drink?' but if such was the case, I have no recollection of it, and prefer to treat it as a canard. In five minutes we were off again, and though towards the end I do recall becoming rather breathless and hoarse, my general memory of the second half is as blank as that of the first. The press response to Wakelam's commentary was mixed: "Some were definitely hostile, talking about quick-fire football and even quick-fire comedians, being obviously and decidedly against such an innovation, which perhaps might tell against their circulation. Some were inclined to be a bit haughty and to damn with faint praise, and I must have gone through the whole gamut of a leading actor's sensations after a 'first night' until I opened the pages of The Times and read a most delightful little bit by Bernard Darwin ... (who) went on to say in his own inimitable way that he supposed that in the course of time all sports and leading outdoor events would be so reported." The listening public was more positive though there was a letter of complaint from the wife of a Welsh ex-international who dubbed Wakelam a plague and a menace "for her husband had got so excited listening-in that he had started playing himself and had smashed up most of her sitting-room furniture". The first: Simplicity - Use ordinary everyday sentences. Don't be too technical. Don't be too facetious. BE NATURAL. The second: Continuity - Keep going as well as you can, without padding up with too much uninteresting and dry material. Wander away very occasionally on to something which is only remotely connected with the game, such as a helicopter overhead, or an outstanding figure in the crowd (it helps the atmosphere). Work in sympathy with your No. 2, and thus avoid double talking. BE CLEAR. The third: Praise but don't criticise. BE FAIR. The fourth: Know your man - 'Eye and brain' I have tried to explain, but the second and more important part of this fourth rule can be summed up in two words: BE FRIENDLY. The BBC viewed Wakelam's commentary as a success and offered him a contract to cover a further ten events, in the event he remained with the BBC for another 12 years. For his next rugby match his No.2 was former Welsh international Rhys Thomas 'Rusty' Gabe, though, Wakelam notes "I am afraid we were guilty of a good deal of overlapping". Next Wakelam was asked to do the first football commentary. Although he knew the game his knowledge of current players was lacking so he wrote a note to one of the team managers only to receive this unhelpful reply on a postcard: "Dear Sir, as you have been chosen to broadcast this match, presumably you already know all about the players". In February 1927 Wakelam participated in what was a bizarre piece of experimental commentary. The match was a rugby international between Wales and France and he was asked if he could intersperse some short pieces in French for the benefit if listeners in France. Although he did speak a little of the language he set about looking up all the rugby terms and expressions in French that he could find. By a stroke of luck when he arrived at the hotel in Swansea, prior to the broadcast, he was greeted by a French businessman resident in the town who agreed to sit next to him in the commentary box and write down some of the salient features of play in colloquial French. Commentaries on other sports followed. As he'd played a little tennis and was a part-time umpire at Wimbledon he was asked to cover the Championship games in the summer of 1927 (alongside another military-styled chap, Colonel R.H. Brand). Commentating on the men's semi-finals he recounts another incident that still occasionally affects live sports coverage, getting cut-off at a crucial stage in the match. At two sets a piece and six games to five in the final set the match was on a knife edge. "I made some kind of remark about a desperate prospective finish and how terribly exciting and thrilling it was. I was not destined to put that finish over though, for when the score reached 30-15, my companion touched me on the shoulder and held up his hand for silence. In his beautifully modulated and honey-toned voice he then gave out the announcement: We are leaving here now and going over to the Girls' Friendly Society Concert at the Albert Hall." 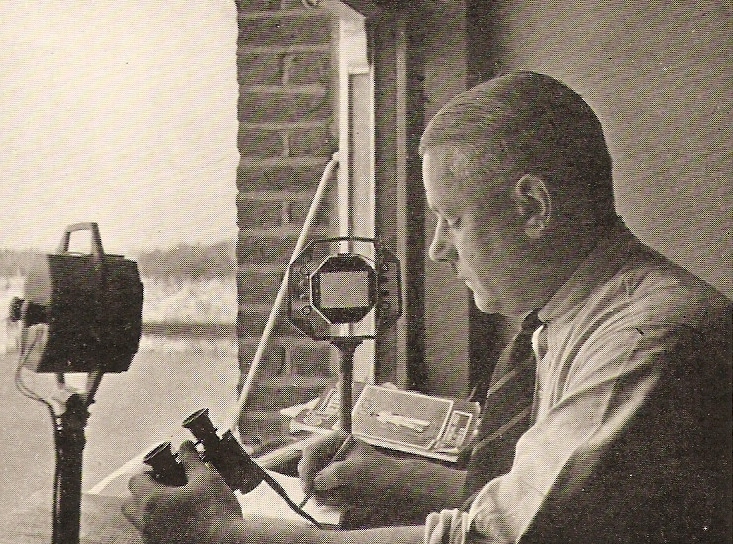 Wakelam apparently "felt like throwing the mike through the window"
Cricket commentary followed on 6 August 1927 with the County Championship match between Surrey and Middlesex. Wakelam immediately encountered a perennial problem for cricket commentators when he recalled that batsman "Andy Sandham was holding the fort, perhaps one of the best men possible in such a case but the rate of scoring, from a broadcasting point of view, was the most distressing, and the high spots and desperately exciting incidents upon which we had gaily dwelt beforehand were absolutely non-existent". Finally another piece of bizarre broadcasting occurred when the BBC covered the 1929 FA Cup Final. The Corporation had been unable to get permission to provide a proper commentary of the Portsmouth Town vs Bolton Wanderers match so it was just billed as "Eye Witness Accounts". In practice this meant that the BBC rented a flat near the ground to install all the microphones and other equipment. They then purchased eight tickets for the eight reporters who would cover the game, each of them witnessing their allotted 15 minutes of play and then leaving the stadium and running at full speed to the flat and relaying what they had seen from their notes for about nine or ten minutes. Gramophone records were on hand to fill any gaps with music. One of the team had been a cross-country runner so his dispatch was given without him sounding breathless. Another, P.W. Adams, marred his report by talking about "Mr So-and-so then passed to Mr Someone-else". And finally an older member of the team, Tommy Usher, arrived a "trifle distressed" and told the audience that "Chelsea have scored", presumably momentarily mislead by the fact that Portsmouth were playing in blue. One writer later described the coverage as "the most humorous item on the BBC programme of 1929." As well as radio Teddy Wakelam also provided some of the first 'sight commentaries' when BBC TV covered Wimbledon in 1937. In addition he appeared on some of the pre-war Monthly Sports Bulletins broadcast from Alexandra Palace as well as writing on rugby for The Morning Post and providing commentaries for British Movietone News. He continued to work for BBC radio until early 1940 (as far as billings in the Radio Times are concerned). Post-war the biographical details are very sketchy though he continued to write about his beloved rugby and in 1954 published Harlequin Story. He died in July 1963 aged 70. Ahead of this evening's classified football results on Sports Report I'm briefly going back to January 1969 when Liverpool and Leeds topped Division 1. Sports Report, then running as part of the Sports Service on Radio 3, was beginning its 21st year on air and was still produced by its founding father Angus Mackay. "He is the brains and heart of the show. The man behind the microphone who leads and guides and inspires and cajoles". 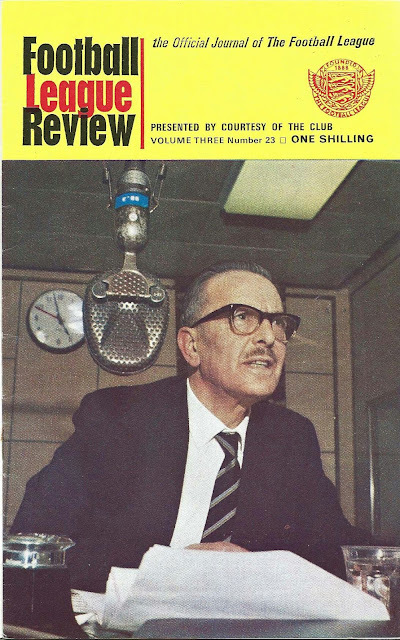 Taking a look behind the scenes of Sports Report in 1969 was Harry Brown writing in the January edition of Football League Review. I'm grateful to John Flitter who kindly scanned these pages for me. Eagle-eyed readers will spot that the photos on page 17 have been transposed; the set starting with Vincent Duggleby are actually at the bottom of the page and vice-versa.